I think that the Universe is contriving to make my Creative Play Date Week both as challenging as possible and as rewarding as possible. It’s challenging because my life this week has been busy. By early afternoon Wednesday, I’d already worked as many consulting hours as I normally do in a week. Plus, I had more family obligations than normal, including an overnight trip to the other end of the state and back. Finding the time for Creative Play this week has been a real challenge and I think that I am supposed to have the experience of having to make the time when life is as busy as it gets. Maybe because the rest of my life is so busy, I am finding the Creative Play time to be so rewarding. Today, I completely lost myself in painting. I wasn’t using any special materials, just my daughter’s nearly-dried poster paints and cheap brush, but I was getting such pleasure from the process of painting that I lost all track of time. And that does more for my blood pressure than 20 minutes of meditation. Here’s today’s project. 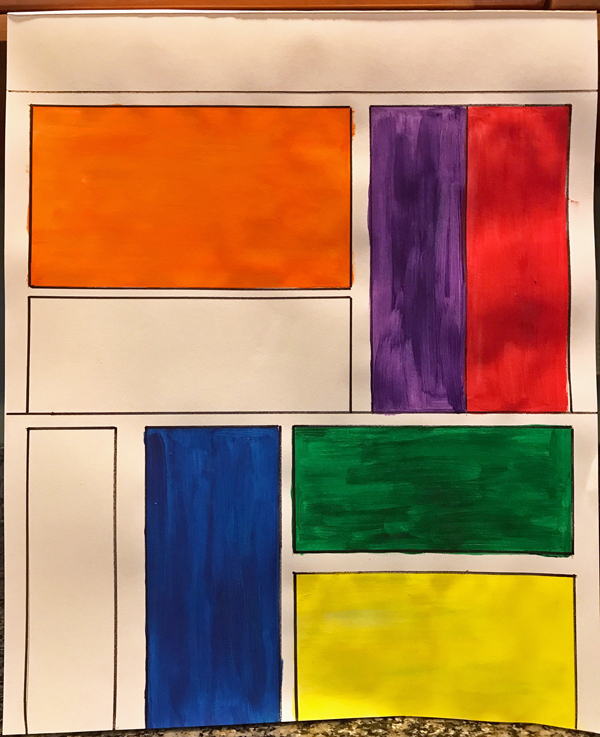 I took the page layout from the June 15, 2017 front page of The New York Times and painted blocks of color. Could be a quilt, don’t you think?